Wednesday June 10th 1896 I came home early this morning. Will had the breakfast started. I soon finished it and it was as early as usual. I was busy most of the forenoon with getting the dinner and looking after little chickens. I went back to town in the afternoon to attend to some business at the bank. I was over the river awhile. Fanny feels better today. I drove "Belle" but do not like the way she acts. I got home by six oclock. I was very tired and went to bed as soon as my work was done. The boys are both plowing corn. 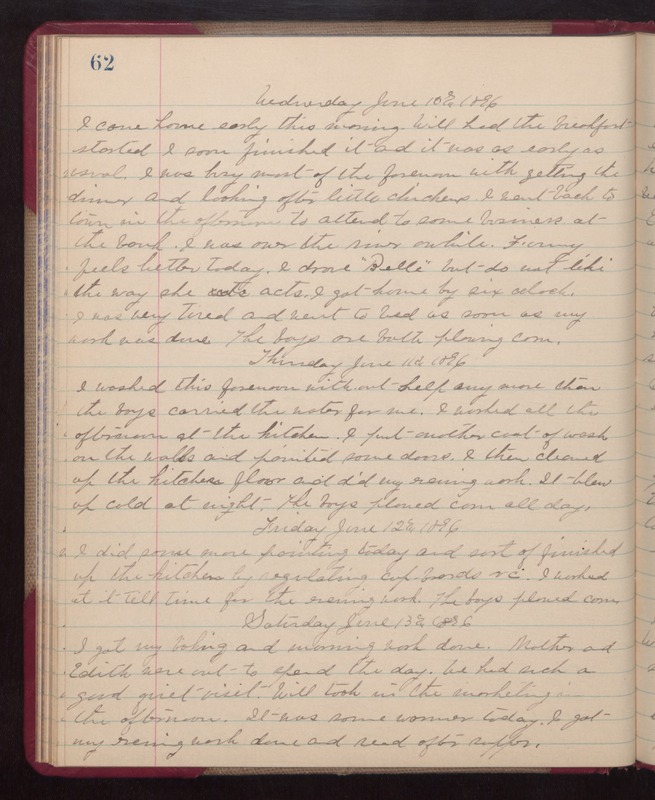 Thursday June 11th 1896 I washed this forenoon without help any more than the boys carried the water for me. I worked all the afternoon at the kitchen. I put another coat of wash on the walls and painted some doors. I then cleaned up the kitchen floor and did my evening work. It blew up cold at night. The boys plowed corn all day. Friday June 12th 1896 I did some more painting today and sort of finished up the kitchen by regulating cupboards &c. I worked at it till time for the evening work. The boys plowed corn. Saturday June 13th 1896 I got my baking and morning work done. Mother and Edith were out to spend the day. We had such a good quiet visit. Will took in the marketing in the afternoon. It was some warmer today. I got my evening work done and read after supper.